I’ve been trying today to remember a time when Oklahoma’s national image was this negative and, really, just downright cataclysmic for the state, and I just can’t come up with a time period. 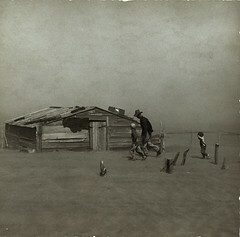 The Dust Bowl days in the 1930s? (1) We lead the nation in executions on a per capita basis. (2) Oklahoma leads the nation in the number of fatal police shootings on a per capita basis. (3) We imprison the most women on a per capita basis. (4) We lead the contiguous United States in the number of 3.0-magnitude or higher earthquakes we endure because of a portion of the fracking process. (5) We have cut education funding the most of any state since the 2008 economic downturn. (6) Attorney General Scott Pruitt continues his relentless and laughable legal wars against the Environmental Protection Agency and the Affordable Care Act. (7) U.S. Sen. Jim Inhofe recently held a snowball in his hand on the Senate floor and claimed once and for all it proves global warming is a left-wing conspiracy. He was widely mocked throughout the world. (8) The governor’s daughter was living in a recreation vehicle at the state “mansion.” The story became known as “trailergate.” It got widespread, national coverage. (9) The Ten Commandments monument at the state Capitol has created controversy and silliness widely reported throughout the world. (10) U.S. Sen. James Lankford isn’t doing much as a political leader these days but attacking Planned Parenthood based on secretly recorded and obviously biased and fraudulent videos. He’s widely known as a fanatic ideologue in Washington but adored by The Oklahoman editorial board as some wise sage. (11) Oklahoma faces a massive teacher shortage because of low pay and poor working conditions. The state’s anti-education mentality has never been on such wide display than now, or at least I can’t remember such a time. (12) The Oklahoma Health Care Authority just cut the payment rate for developmental disabilities service providers. Read that sentence again. Fill in the blank. I know I’m leaving something out when I haven’t even mentioned state Rep. Sally Kern or any other of the cast of characters in the state legislature that sponsor obviously unconstitutional bills that cost the state money in legal fees when they have to be unsuccessfully defended. We kill. We imprison. We cut education. We deny health care to poor people because they are poor. The world looks on at the spectacle, and it costs the state economic development and lowers our quality of life here. There’s not much to be done to save Oklahoma’s image at this point, especially since the local media is complicit in the tragedy. They wallow in the cesspool, get used to the stench and rake in what conventional advertising dollars are still left out there based on the Okie spectacle . . . for now. Laugh or cry. Take your pick. Oklahoma is a longtime laughingstock of the world, and it’s only getting worse, folks. No, not even the Oklahoma City Thunder can get us out of this mess with a national championship.